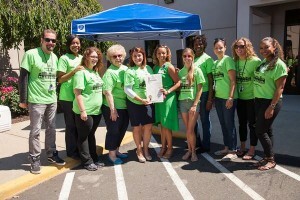 Community Health Center, Inc. (CHC) celebrated National Health Center Week 2015 (NHCW), as part of a weeklong campaign (August 9 -15) by providing free, family friendly events across the state of Connecticut. Community Health Center’s highlight their 50th year of success with providing quality health care nationwide by hosting community events. Some of the accomplishments America’s Health Center’s provide are $24 billion in annual health systems savings, reducing infant mortality rates, and reduced unnecessary hospitalizations. CHC felt the best way to participate by providing family friendly events with private free HIV and Hep C testing, safety demonstrations, nutrition, exercise, raffle prizes, and much more. In the middle of National Health Center Week a highlight to one of the events was in New Britain. In the heart of downtown right outside the CHC Medical building Mayor Erin Stewart stopped by to recognize the passionate work of all CHC staff, and meet local vendors. 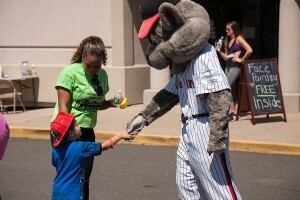 Along with Mayor Erin Stewart another New Britain staple stopped by to snap a few pictures, New Britain’s resident mascot, Rocky from the New Britain Rock Cats. Children were delighted to see Rocky and happily take a few pictures. 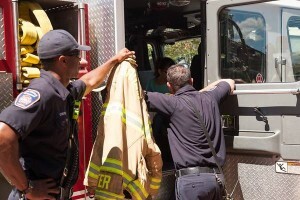 Along with receiving special guests in New Britain, CHC also saw many different shows of support across the Connecticut locations. Many of our communities gained a broader knowledge of what CHC has to offer and learn about the people CHC serves.